Educational tool helps increase patient’s knowledge of diabetes terms and goals of care. In English and Spanish. Players learn about diabetes management while having fun! A must have for support groups and in the classroom setting. Up to 30 can play! 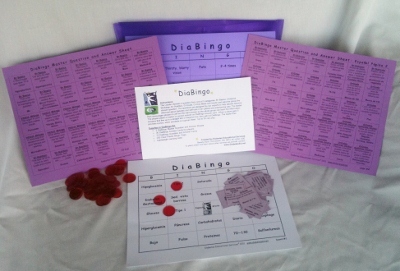 Diabetes Bingo – A fun way to help class participants or support group attendees to learn about the complex topic of diabetes while having fun. Includes 70 questions, 30 playing cards, 300 bingo chips and a durable carrying case. Playing cards and questions comes in both English and Spanish.